Visit us at the 4th Annual Albuquerque Comic Con! For the 4th straight year, Its All About Satellites is excited to have our DIRECTV booth at the Albuquerque Comic Con. This years Comic Con features many Film and Media stars including Star Trek Next Generation star Jonathan Frakes, Ray Park, Courtney Anne Mitchell and Corey Feldman. Comic book creators and artists include Rich Buckler, Steve Englehart and George Perez. And don’t forget the incredible Cosplay. This year Comic Con will feature Toni Darling, Rosanna Rocha, and Albuquerque’s own Katybear McCullough among other professional costume designers, models, and the best cosplayers in the galaxy. 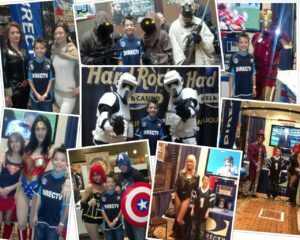 Come meet your favorite superhero, get signatures from your favorite stars, see the amazing costumes and get incredible deals on DIRECTV and swag you can only get at our DIRECTV booth!